Tests are not for the sake of the teacher, but for the benefit of the student. As a teacher, I don’t ask test questions because I need to know the answers. I ask questions because my students need to know the answers. Likewise, God ordains tests for us, not for his sake, but for ours. 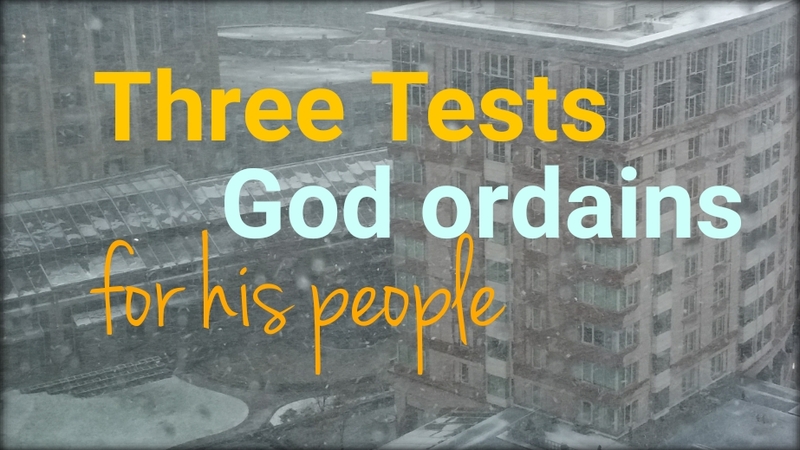 He ordains tests today just as he did in the Old Testament with the testing of his people, and in the New Testament with the testing of the disciples. From those who have gone before us, we find several reasons for tests in Scripture. And knowing that tests are purposeful, we can rest, understanding that the Master is fully in control of both the test and the outcome. I remember seeing the eyes of the people around me for the first time in elementary school once I got glasses. I didn’t know I couldn’t see until I took a vision test in fourth grade. My eyesight had gradually weakened, until I thought that blurry faces and faint lines on the chalkboard were normal. That simple diagnostic test revealed an issue I never knew existed. God tells us that he never tempts us to sin (see James 1:13). The tests we face are not designed to lead us to sin; rather, they reveal the sin that already lurks in our hearts, ready to show itself at any opportunity. The next time you’re put to the test—whether it’s conflict with a loved one, bad news, or horrible traffic—and react in an ungodly way, remember that God ordains some tests to “know what was in your heart.” This is his grace —to reveal our need of him more clearly, and we throw ourselves on his mercy. I hate exams as much as my students do. Like all teachers, however, I know that without the pressure of a quiz or exam, my students are not likely to learn the necessary lessons. We face similar educational tests when the unexpected financial crisis hits, the frightening diagnosis is delivered, or a heartbreaking betrayal is revealed. In all cases, Christ is the perfect teacher, and he can be trusted to prepare and carry us through the crisis. If, like the disciples, we fail the test, we can also trust Christ to handle the storm, bringing us through by his grace to the other side. Sometimes tests are necessary to demonstrate that a candidate is certified in a particular field. We take driving tests, college entrance exams, professional licensing exams, and more. In all cases, standards are set, questions are asked, and the answers are evaluated by experts who determine whether candidates pass or fail.